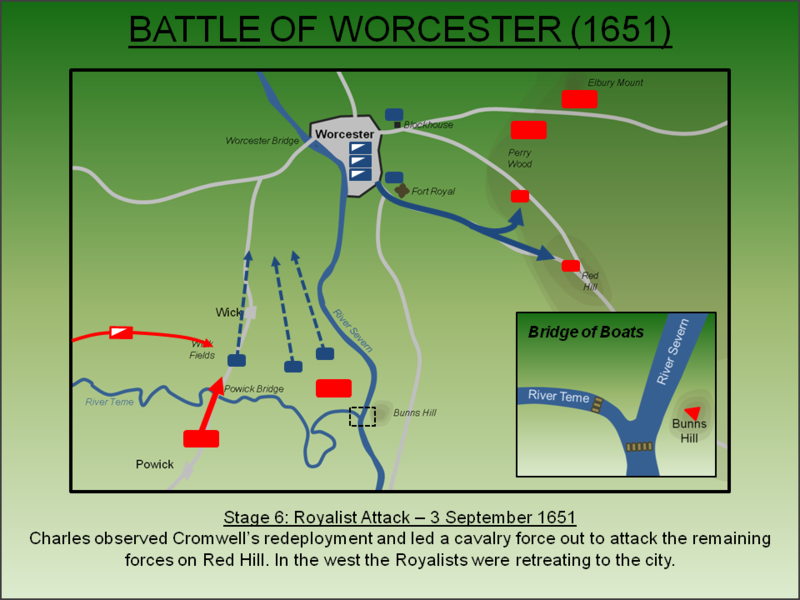 Described by Cromwell as his “crowning mercy”, the Battle of Worcester (1651) saw the total military annihilation of the Royalist cause and marked the end of the Civil War. Despite strong leadership from Charles II, the Parliamentary force proved too strong and ultimately surrounded and stormed the city. In January 1649 King Charles I of England was tried, convicted and executed for his part in causing the Civil War. Although Scotland was allied to the English Parliamentarian cause, Charles's execution had been done without reference to the northern Kingdom. The Stuart dynasty (known as Stewart in Scotland) had ruled that country since 1371 and there was reluctance to displace them especially as there was a clear and suitable heir in the form of the King's eldest son, Prince Charles. Accordingly after the execution of Charles I, Scotland's Committee of Estates proclaimed his son as King of all Great Britain although not before they secured extensive concessions in relation to the safeguarding of the National Covenant and its introduction in England. The Prince landed back in Scotland on 23 June 1650. In England, where the country was run by a Parliamentary committee known as the Council of State, it was anticipated that the new Scottish King would be a source of trouble and a large army was sent north. This English force was intercepted by the veteran Scottish commander David Leslie but he was decisively defeated at the Battle of Dunbar (1650). English forces then overran Lothian and the Borders but Charles continued his campaign and was crowned King at Scone on 1 January 1651. English forces then pushed further north to capture him but he evaded a fight, bypassed them and advanced south into England. This was a daring stratagem with Charles hoping to ignite a general uprising against the Parliamentary regime. The Council of State saw the Royalist incursion into England as nothing short of a national emergency. With Cromwell still in Scotland, the nearest Parliamentary force to deal with the invasion was at Berwick-upon-Tweed under Major-General Harrison. This force was only 4,000 strong so orders were issued instructing the county militias in the north to mobilise and join him. Cromwell also sent a 3,000 strong cavalry detachment south under Major-General Lambert which attached itself to Harrison's army. Furthermore a new force, drawn from the militias of the southern counties, was assembled in the Midlands and placed under the command of Lieutenant-General Fleetwood. Concurrently Cromwell himself, with his large army, was rushing down the east coast. The Royalist army marched south along the main western route arriving in Warrington on 16 August 1651. Attempts by the (Parliamentary) Cheshire militia to hold the bridge over the River Mersey failed. Harrison and Lambert then drew up for battle on Knutsford Heath to bar the Royalist approach to London but Charles had decided not to march directly on the city and instead took a more western route into Staffordshire hoping to continue recruitment. Charles also detached James Stanley, Earl of Derby - who had recently returned from the Isle of Man to join the Royalist cause - to Lancashire to raise more forces. He successfully recruited over 1,500 men but was attacked and defeated by Colonel Lilburn at the Battle of Wigan on 25 August 1651. This action deterred many others from joining the Royalist ranks and, coupled with supply problems, forced Charles to look for a location to re-provision the army. When Shrewsbury refused him entry, the Royalists made for Worcester. Worcester was an obvious choice for the Royalists. It was a walled city and had proven itself a staunch ally of Charles I during the First Civil War including enduring a substantial and damaging siege in 1646. The city was also relatively close to Wales, an area with extensive Royalist sympathies and which was anticipated to provide an ample supply of new recruits. It was also near Gloucester where it was hoped Edward Massey, former Parliamentarian Governor but now a convert to the King’s cause, would exert influence to encourage further support. 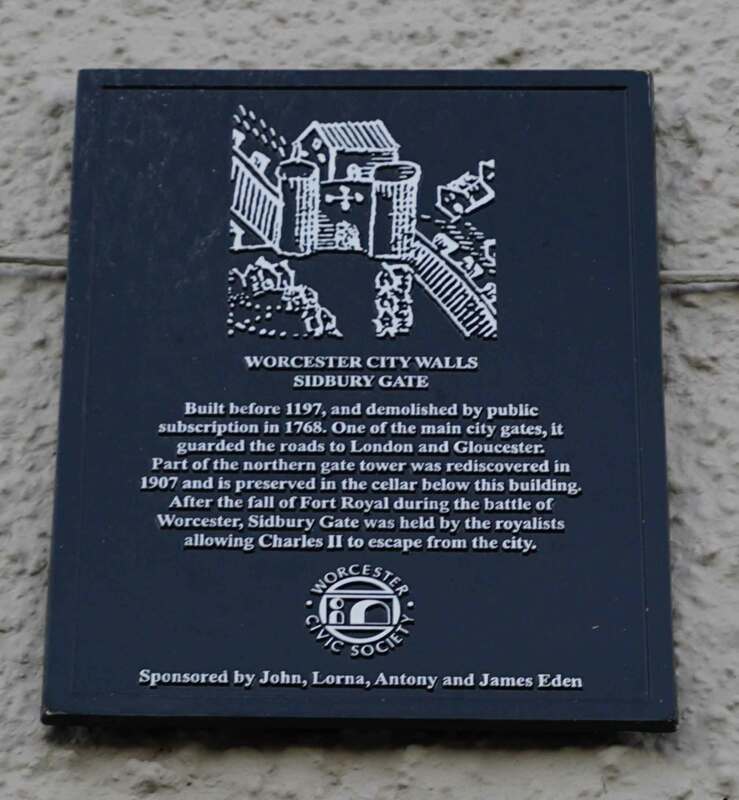 The Royalist forces entered Worcester on 23 August 1651, dislodged a 500 man Parliamentary garrison under Colonel James and immediately started re-fortifying the city. 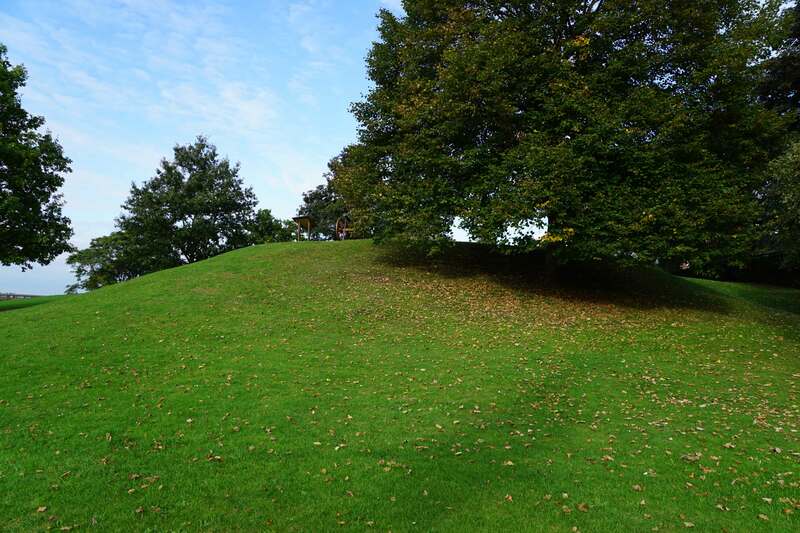 An earthwork redoubt, Fort Royal, was constructed to the south-east of the city walls commanding the high ground. A blockhouse was also constructed outside the city's main gate, St Martin's, which barred access along the London road. However the high ground to the east, namely Red Hill and Perry Wood, was not fortified - presumably due to the concerns it would extend the Royalist perimeter too far. On the western side of the River Severn though, the Royalists occupied vast swathes of the territory as far south as Upton. Parliamentary forces rendezvoused at Evesham, just 13 miles south-east of Worcester, on 27 August 1651. Cromwell assumed overall command of the forces under Harrison and Lambert but he left Fleetwood in charge of the southern militias. The Parliamentarians were resolved that the Royalist army should be completely destroyed and accordingly Worcester had to be encircled otherwise they would just melt away westwards into Wales. To do this he needed to get a portion of his force across the River Severn which was a formidable natural barrier. There were bridges at Gloucester, Upton, Worcester and Bewdley plus an established fording point at Tewkesbury. Given the Council of State remained alarmed by the situation, Cromwell needed a speedy victory if his own position wasn’t to be placed at risk. Accordingly Lambert was detached to capture the nearest crossing at Upton. By the time the Parliamentarian force arrived in vicinity of Worcester, it numbered around 28,000 strong and was drawn together from various Parliamentary armies. The main component was directly under Cromwell and his veteran deputies, Harrison and Lambert. The less experienced militias, which had been raised from the south and east of England, were placed in a separate army under Lieutenant-General Fleetwood. 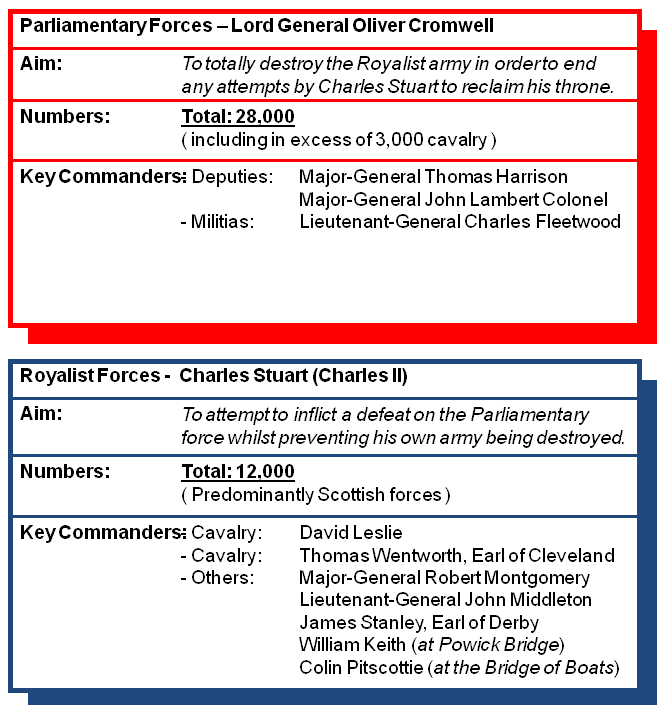 The Royalist force, directly under the command of Charles Stuart (Charles II), numbered around 12,000 and accordingly was less than half the size of the army available to Parliament. His deputy, and the representative of the Scottish Committee of Estates, was the experienced commander David Leslie who had won distinction at the battles of Marston Moor and Philiphaugh but had also lost at Dunbar the previous year. The Royalist army also boasted a number of key personnel who had recently changed sides such as Edward Massey, the former Parliamentarian Governor of Gloucester, and James Wemyss, who had served as Parliament's Master of Ordnance. These were high calibre defections that gave significant credibility to the new Royalist effort. The initial phases of the battle, a series of skirmishes as the Parliamentarians moved into position, took place between 28 August 1651 and 2 September 1651. 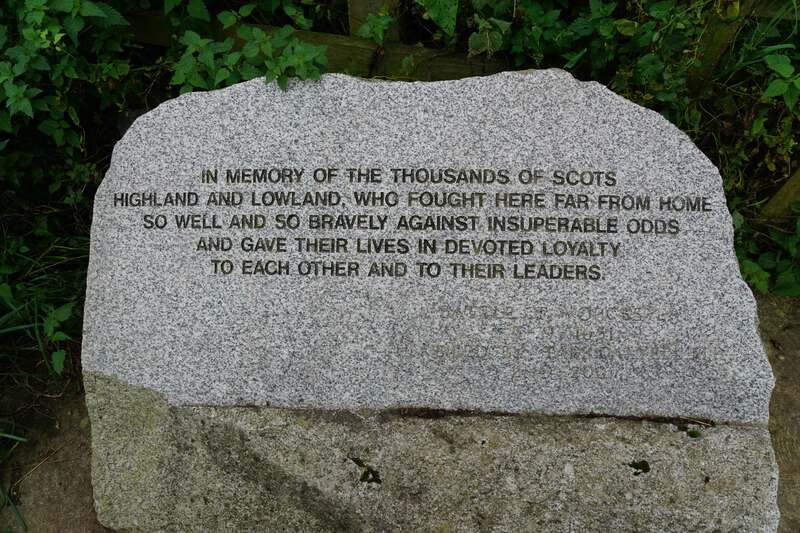 The main battle itself took place on 3 September 1651, the anniversary of Cromwell's victory at Dunbar. 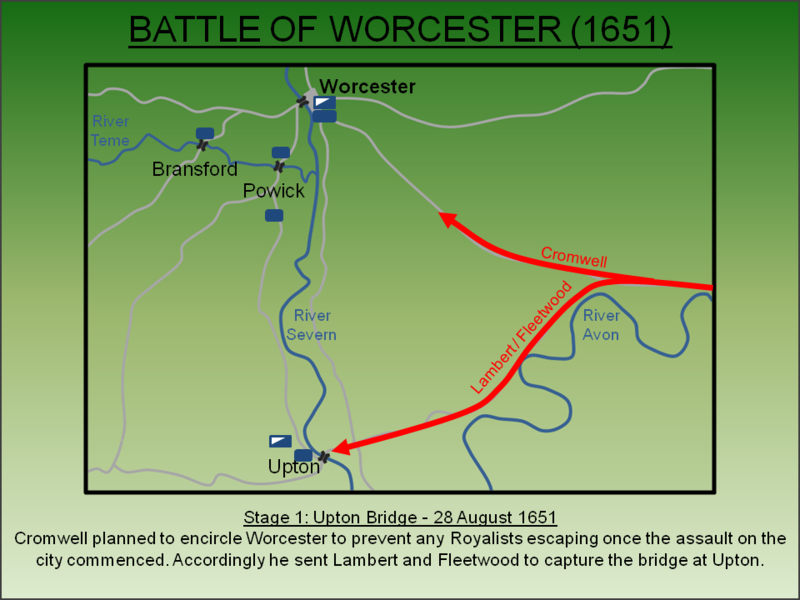 On 28 August 1651, in order to commence the planned encirclement of Worcester, Lambert led a 1,000 strong detachment to seize the crossing over the River Severn at Upton. The Royalists had broken down part of the bridge but a single plank had been left in place and it was poorly guarded. Around 10am, concurrently with low tide, a forlorn hope of 18 dragoons rushed over the plank and occupied the church directly opposite. Concurrently Lambert's force forded the river and secured the bridgehead. He was augmented by the arrival of Fleetwood's infantry force enabling him to repulse a counter-attack by the Royalists. 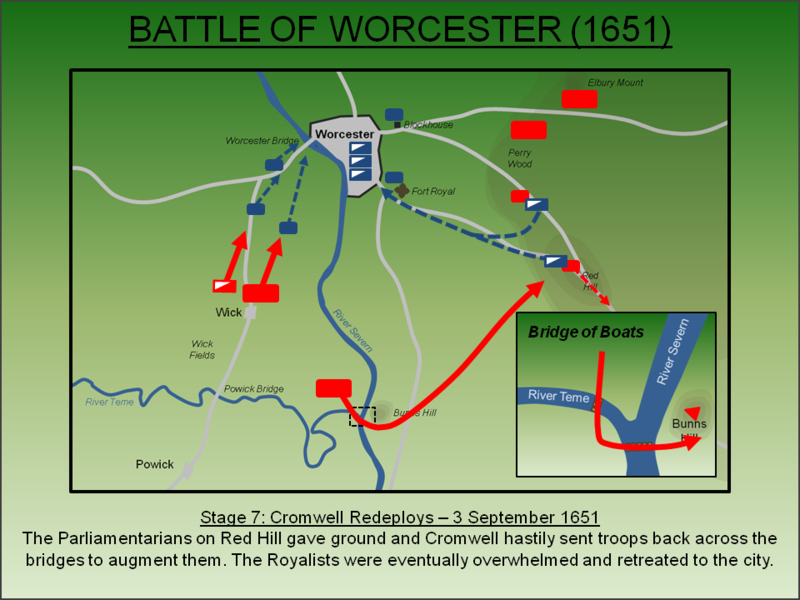 The following day (29 August 1651) Cromwell arrived with his main force at Red Hill, just over one mile to the east of Worcester and overlooking the city. From there he deployed his men to control all the eastern approaches to the city. Their dispersed positioning did however make them vulnerable and the Royalists attempted to exploit this the same evening. A sortie of 1,500 men under Lieutenant-General Middleton and Colonel Keith assaulted Red Hill but the attack was defeated allegedly due to the betrayal of the plan by one of the city's tailors. Over the next few days Cromwell consolidated his position on the high ground whilst concurrently securing the eastern banks of the River Severn to the south of the city. Whilst Fleetwood's force was still in Upton, he was now preparing to push northwards in order to contain Worcester from the west. 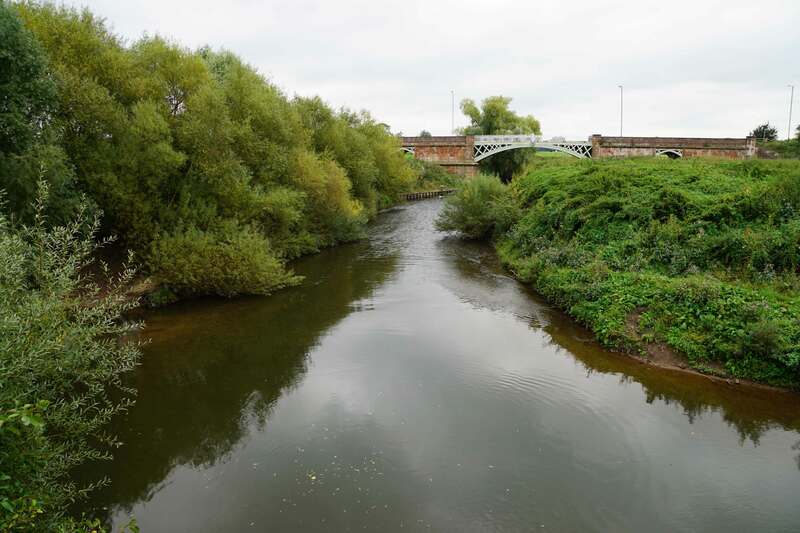 But this area was under effective Royalist control and hard fighting was expected whilst there was also a substantial natural barrier, the River Teme, in between Fleetwood and Worcester. Accordingly, before Fleetwood could advance, a means of moving troops across the River Severn much nearer to Worcester was required and so Cromwell started construction of a pontoon bridge. No later than 30 August 1651 a bridge constructed from boats nailed together, many of which may have been transported in the supply carts from the Scottish campaign, was being assembled along the eastern bank of the River Severn. As Cromwell could not be sure of how far Fleetwood would be able to advance, the work was done at the confluence of the Rivers Severn and Teme which offered Cromwell freedom to choose whether to bridge to the north or the south of the latter depending upon the progress made in the west. Furthermore this location was overlooked by Bunn's Hill, a large mound on which artillery was installed to cover the work and subsequent deployment. The bridge was ready for deployment in the early hours of 3 September 1651. Around 5am on 3 September 1651 Fleetwood commenced his advance north from Upton. He was persistently attacked by Royalist skirmishers who slowed his approach. It took almost nine hours to reach the banks of the River Teme and it wasn't until 2pm that his forces approached Powick village. Fearing that Fleetwood's attack had stalled, Cromwell deployed his bridge of boats to the south of the River Teme to provide a direct link with his subordinate. The Royalists dispatched Colonel Pitscottie with 300 Highlanders to oppose Cromwell but these men were outnumbered ten to one as the Parliamentary forces swarmed across the bridge of boats. Concurrently Fleetwood's men dislodged the determined Royalist resistance centred on Powick Church. Defeated the Royalists were pushed back to Powick Bridge leaving the southern banks of the River Teme to Parliament. 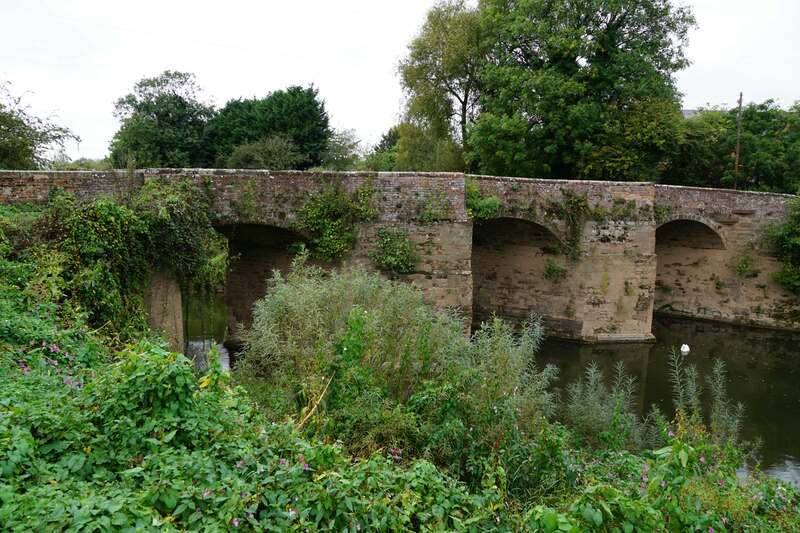 With the south banks secured and the northern side covered by artillery on Bunn's Hill, construction of a second bridge of boats started in order to provide access north of the River Teme. Nevertheless the Royalists continued to offer a stubborn defence. Although the south side of Powick Bridge was in Fleetwood's hands, it was being vigorously contested. Furthermore, to bar access from the (second) bridge of boats, the Royalists had occupied the hedgerows a field back from the crossing. Whilst still in range of the Parliamentary guns, the only way to dislodge them was by infantry assault which meant the artillery could not be used due to the risk of friendly fire. Cromwell sought to overcome this obstacle by calling for more men and instructed Lambert to send forces from Red Hill to augment him. It was a rare lapse of judgement for this most able of military commanders. Lambert was initially reluctant to send any reinforcements lest it weaken the eastern forces. He relented however and the additional men crossed both bridges of boats and forced their way through the Royalist defenders. Concurrently Colonel Twistleton was dispatched to the west to capture Bransford and, having duly did so, moved to encircle the Royalists defending Powick Bridge. The Royalists fell back to Worcester. However, the Parliamentary manoeuvres had not been lost on Charles who was watching developments from the top of Worcester Cathedral. Despite opposition from Leslie, Charles mustered his forces ready to assault the depleted Parliamentary positions on Red Hill now simply held by the inexperienced Cheshire and Essex militias hoping to dislodge them, wheel around and take the bridge of boats. Charles led his forces out of the city via Sudbury Gate around 4pm focusing his attack on Red Hill whilst the Duke of Hamilton's Regiment diverted to take Perry Wood. The Royalist assault threw back the Parliamentarians on Red Hill but the attack on Perry Hill was less successful. Nevertheless Cromwell now realised he was over-committed in the west and sent his troops rushing back over the bridges. Slowly the situation on Red Hill and Perry Wood was stabilised. Had Leslie, who was still in Worcester, now deployed in support of Charles it is possible they could have held. But Leslie did not move, doubtless realising the military situation to the west was now precarious, and accordingly the Royalists to the east were driven back into Worcester. Despite the scare in the east, Cromwell was now in the position he had anticipated from the start. 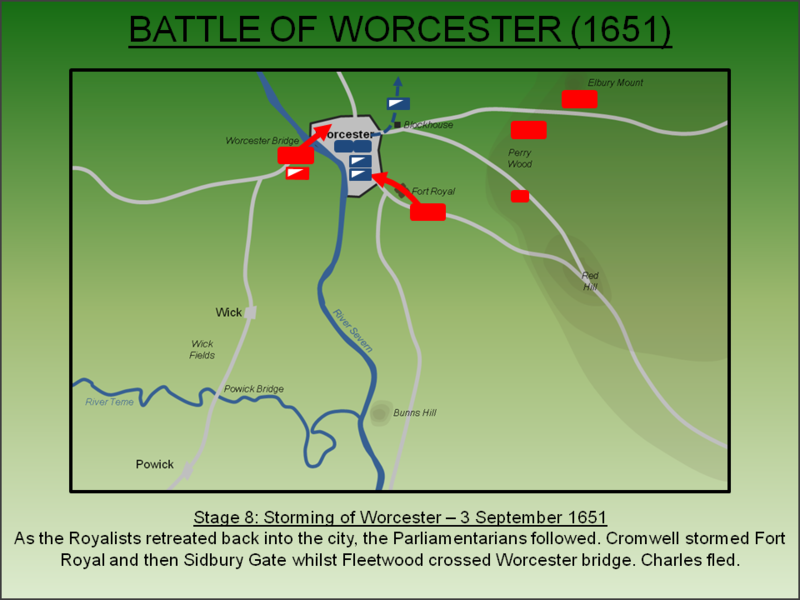 Worcester was surrounded and as Charles's assault filtered back into the city, the Parliamentarians followed pressing their attack with vigour. Fort Royal was surrounded and, when the garrison refused to surrender, it was stormed. With the captured guns, the Parliamentarians then fired upon Sidbury Gate and the Commandery, the Royalist headquarters. A cavalry charge by Thomas Wentworth, Earl of Cleveland held the Parliamentarian forces at Sidbury just long enough for Charles, escorted by Leslie's cavalry, to escape through St Martin's Gate, the last of the city gates still in Royalist hands by this time. Around 3,000 Royalists were killed during the battle with many of the remainder taken prisoner. Unlike the first Civil War, there was no clemency for the rank-and-file with many of those captured sold as slaves to work in the plantations in the West Indies and America. Charles himself went into hiding and eventually escaped to France. 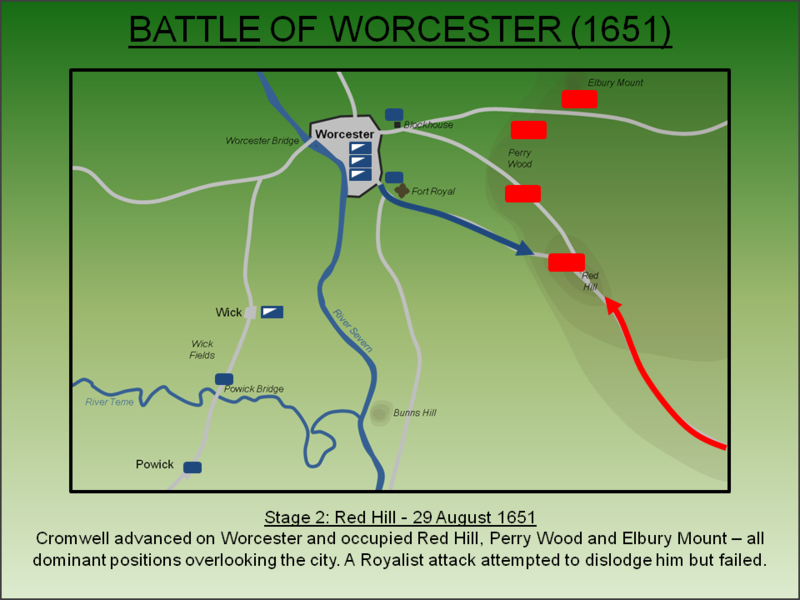 Worcester was the last battle of the civil war and amounted to the final, military annihilation of the Royalist cause. Despite the escape of Leslie's cavalry, it soon dispersed leaving no military force to challenge the Council of State. For the next eight years there was no King in either England or Scotland with both countries effectively ruled by Oliver Cromwell until his death on 3 September 1658 – the anniversary of his victories at Dunbar and Worcester. But thereafter the regime crumbled and in 1660 Charles was invited to return as King. The defeat at Worcester was clearly not forgotten as revenge was soon meted out on the surviving Parliamentary commanders. Harrison - who was also a regicide (a signatory to the execution warrant of Charles I) was hung, drawn and quartered - whilst Lambert was imprisoned and Fleetwood barred from public office. Blout, T (1830). Boscobel Tracts. London. Burnet, G (1852). Memoirs of the Lives and Actions of the Dukes of Hamilton. Oxford. Carey, H (1842). Memorials of the Great Civil War in England. London. Carlyle, T (1846). Letters and Speeches of Oliver Cromwell. London. Foard, G and Partida, T (2005). 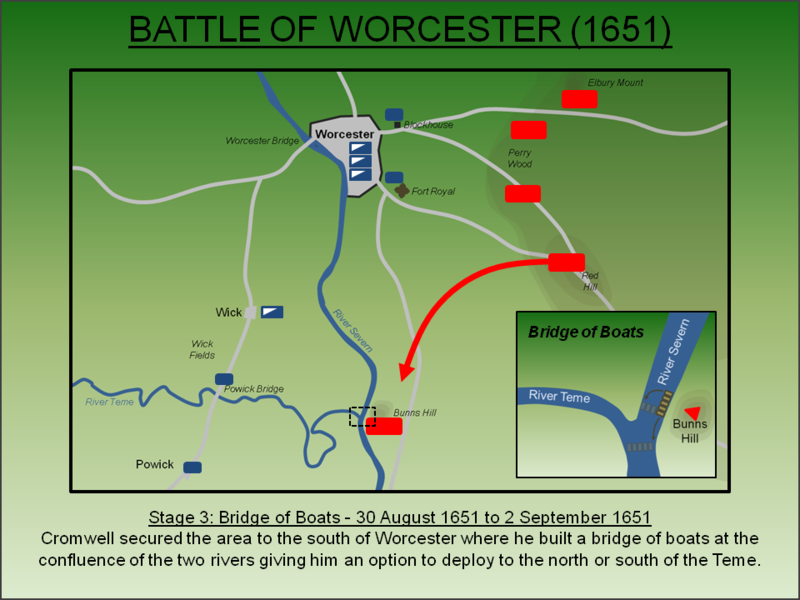 Battlefields Trust: Battle of Worcester (1651) Online Resources. Battlefields Trust. Fraser, W (1888). Memorials of the Family of Wemyss. Edinburgh. Lancaster, J.H.D (2016). 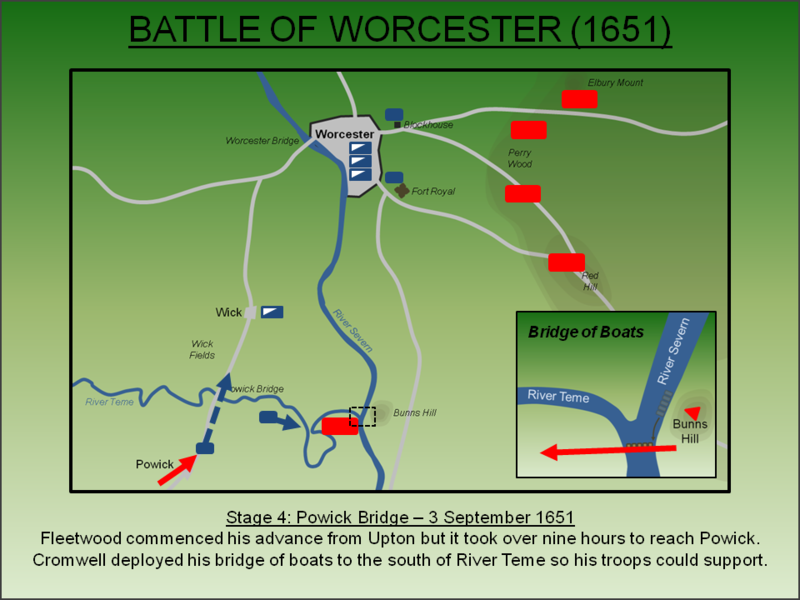 Worcester and Powick Bridge: Battlefield visit notes and observations. CastlesFortsBattles.co.uk. Ordnance Survey (2015). Worcester. 1:1250. Southampton. Wharton, S (1651). 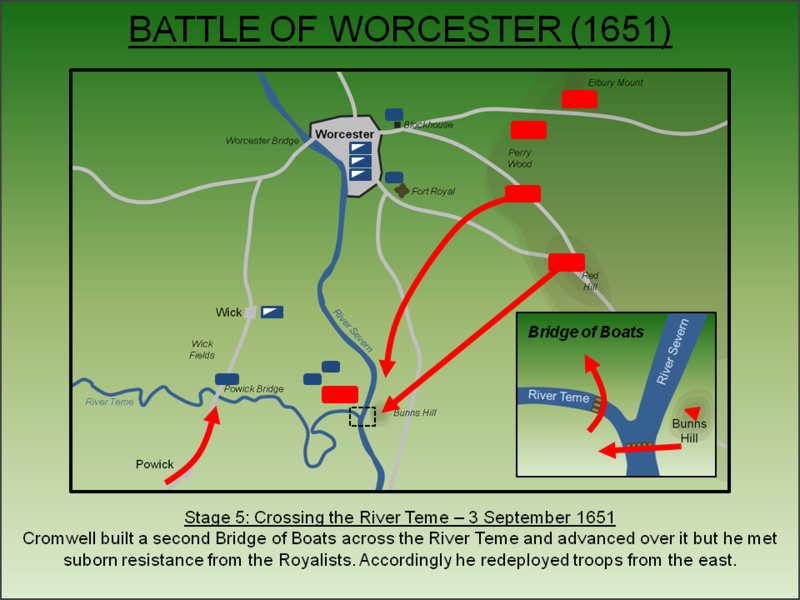 Account of the Battle of Worcester. London. 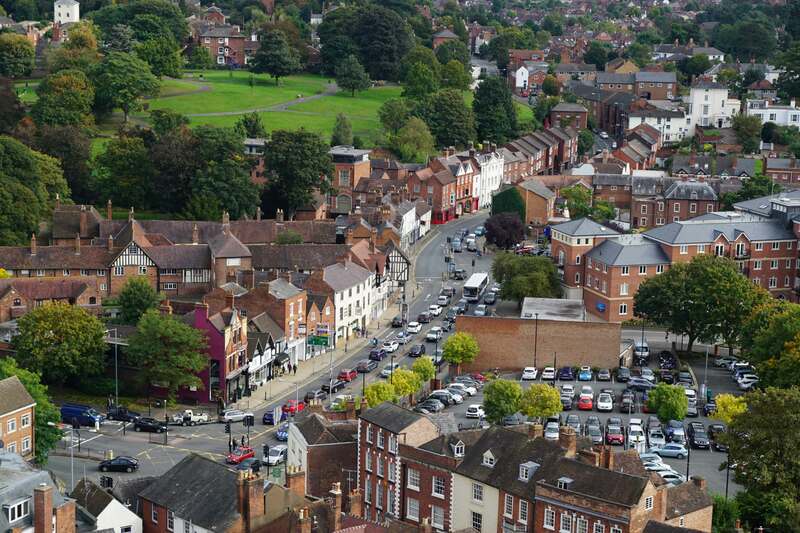 The Battle of Worcester was fought over a wide area and a visit will comfortably fill a day. 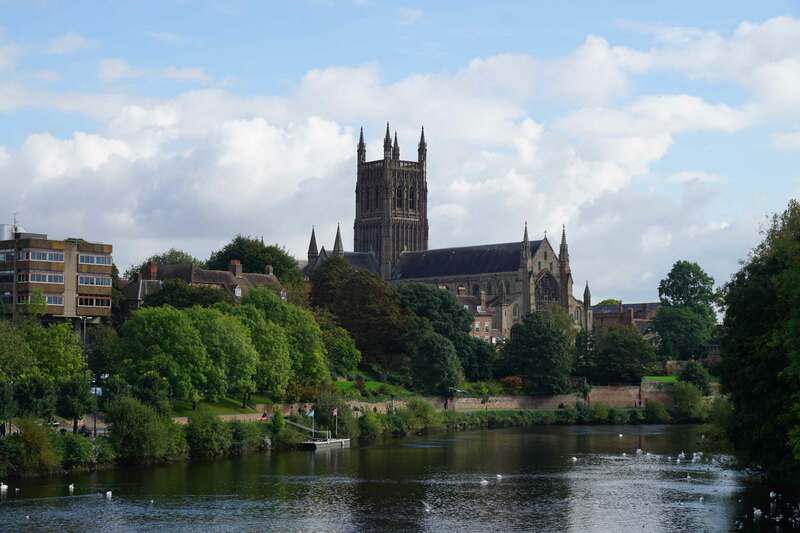 The best starting point is in the city itself where the tower of Worcester Cathedral offers a superb vantage point and was where Charles himself viewed the progress of the battle. 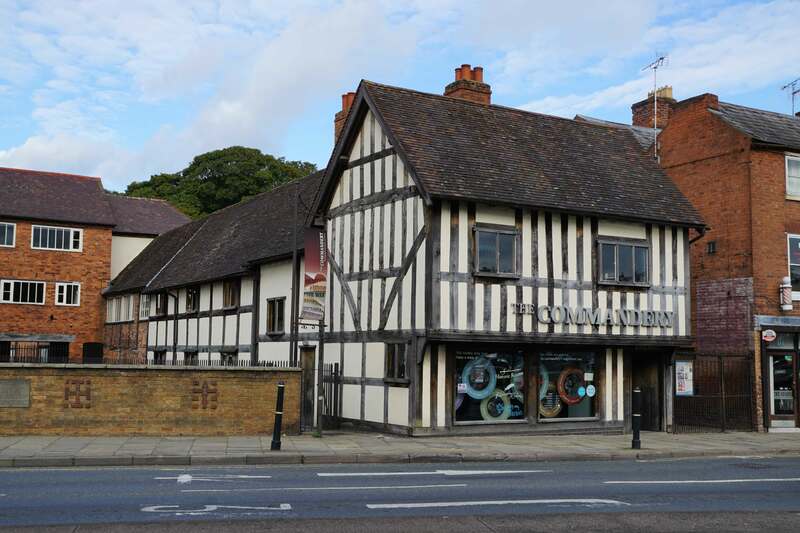 Also in the city the Commandery, the Royalist headquarters, is open to the public and stands near the plaque marking the site of the (now vanished) Sidbury Gate where the final stages of the fighting took place. Fort Royal, the earthwork bastion stormed by Parliamentary troops, has been landscaped into a public park but still offers a good view and explains why the site was fortified. Outside the city a visit to Powick Bridge is essential and there is a superb walk along the banks of the River Teme and the River Severn although the view is somewhat obscured by trees. 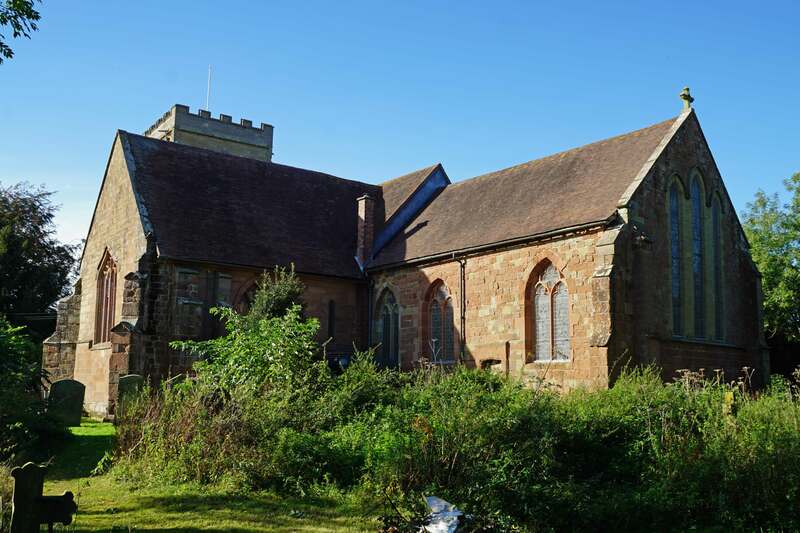 Powick Church, where fierce fighting took place between the two forces, is also well worth a visit. There is also a battlefield viewpoint. Upton. The bridge at Upton was the nearest crossing over the River Severn. Major-General Lambert was tasked with seizing the bridge which had been partly dismantled by the Royalists but who had left a single plank in place. A forlorn hope of 18 dragoons was sent to rush it and seize the church directly opposite. Concurrently Lambert's force, around 1,000 strong, forded the River Severn. The Royalists counter-attacked, including an assault by cavalry under Massey, but the Parliamentarians repulsed them. The medieval bridge has now been replaced with a modern crossing. Bridge of Boats. 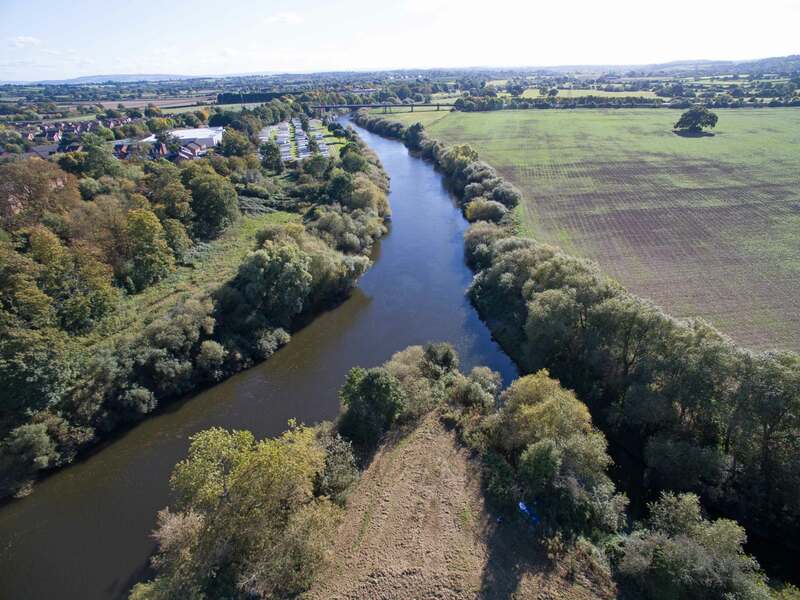 Cromwell secured the eastern banks of the River Severn (to the left in the photograph) and began building a pontoon bridge at the confluence with the River Teme (bottom right). 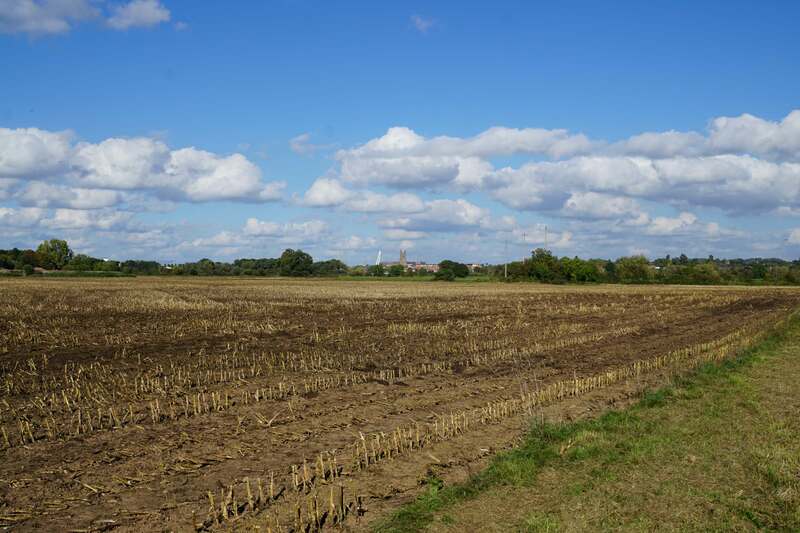 Construction at this location gave him the option of deploying it to the north or south of the River Teme dependant upon how far Fleetwood was able to advance once the assault on Worcester commenced. Ultimately the bridge was deployed to the south with a further pontoon being constructed across the River Teme. Powick Church. Fierce fighting took place around Powick church and damage to the structure caused by small arms fire can still be seen. River Teme. 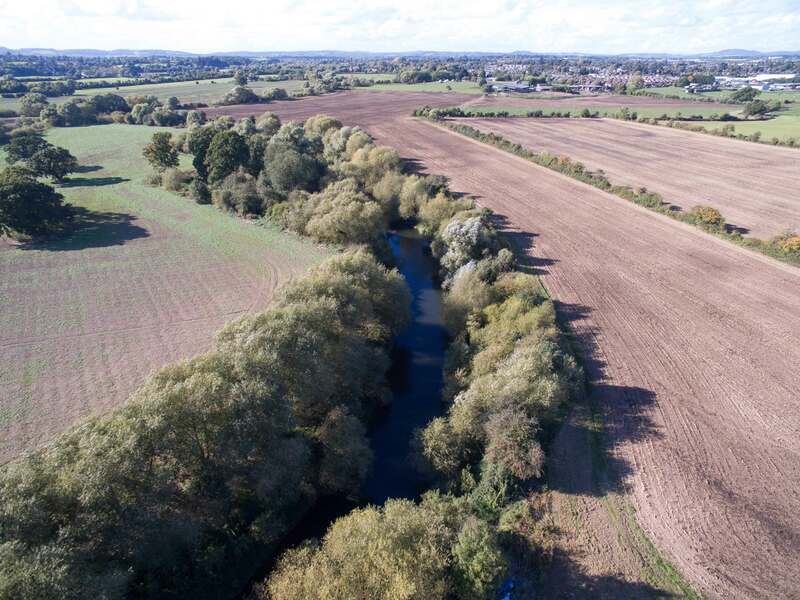 Although narrower than the Severn, the River Teme was nevertheless a formidable natural barrier which blocked the path of the Parliamentarians to the west. 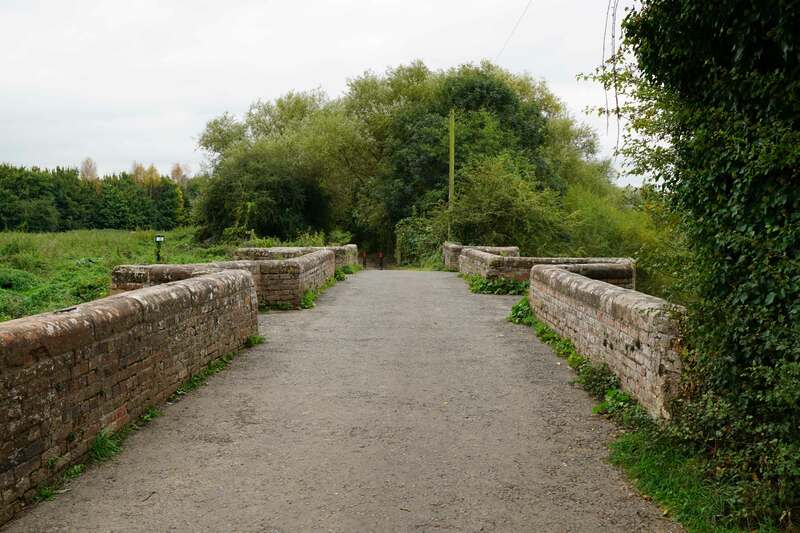 The river had steep banks and accordingly crossing points on the line of advance were limited to Powick Bridge and a second bridge of boats that was built by Cromwell. Powick Bridge. 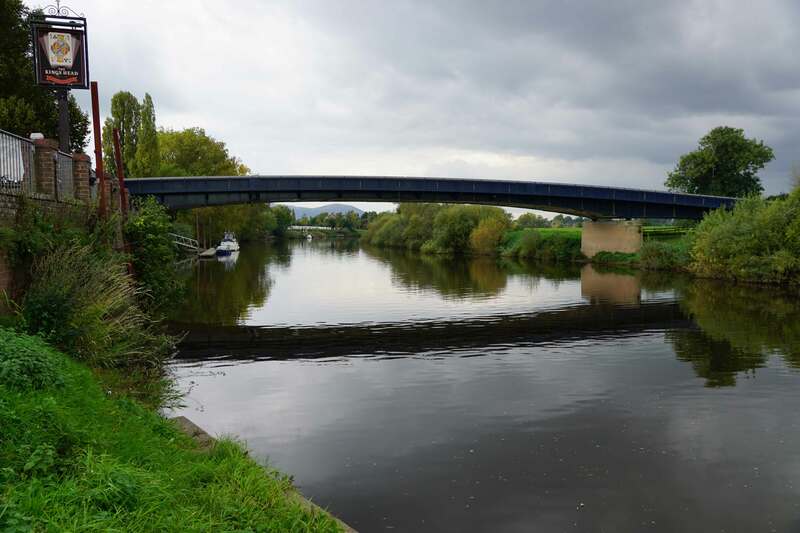 The bridge had been the scene of the opening hostilities in the First Civil War and the same fields hosted fighting again during the Battle of Worcester - which ultimately proved to be the last battle of the wars. The medieval bridge survives. Battlefield Monuments. 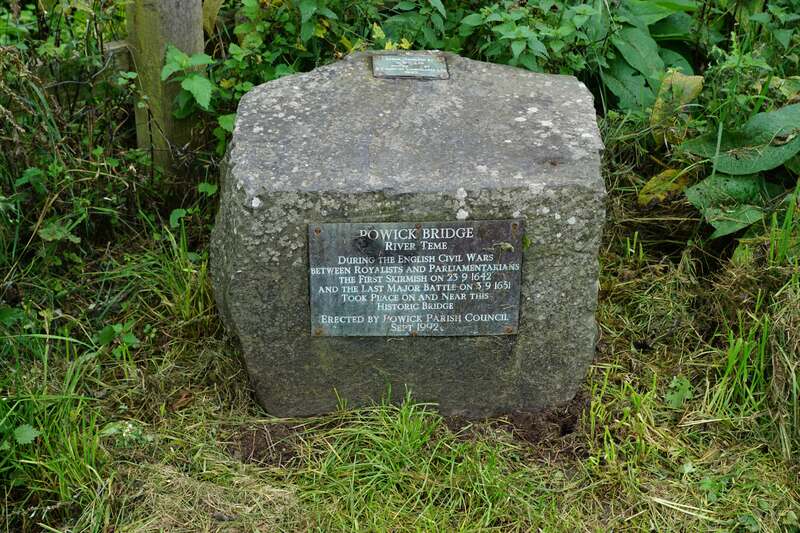 The two monuments can be found adjacent to Powick Bridge. Worcester. Once Parliamentary forces had crossed the River Teme the Royalists had little choice but to retreat towards the city. Red Hill and Perry Wood. The high ground to the east of city was occupied by Parliamentary troops. The Royalist could have occupied these positions before the battle but presumably decided not to due to a lack of manpower. The site of Fort Royal, now a public park, can be seen to the right of the photograph. Fort Royal. 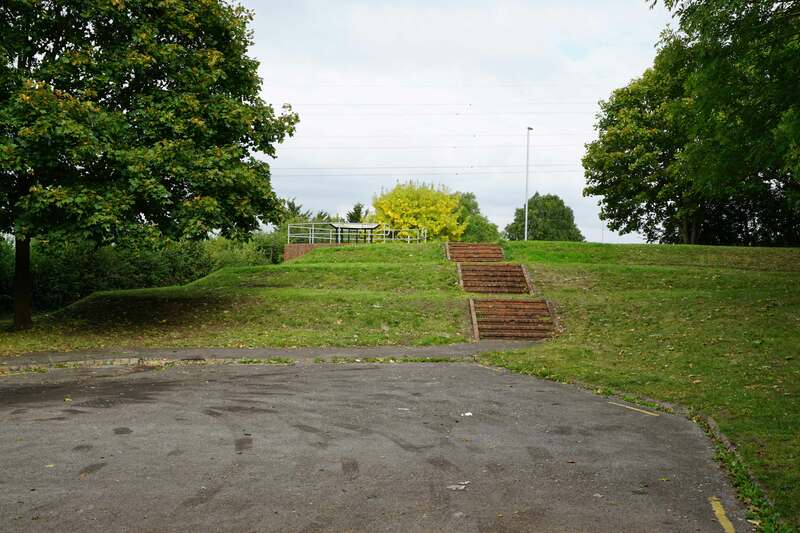 An earthwork artillery bastion designed to occupy the high ground overlooking Worcester's Sidbury gate. Commandery. 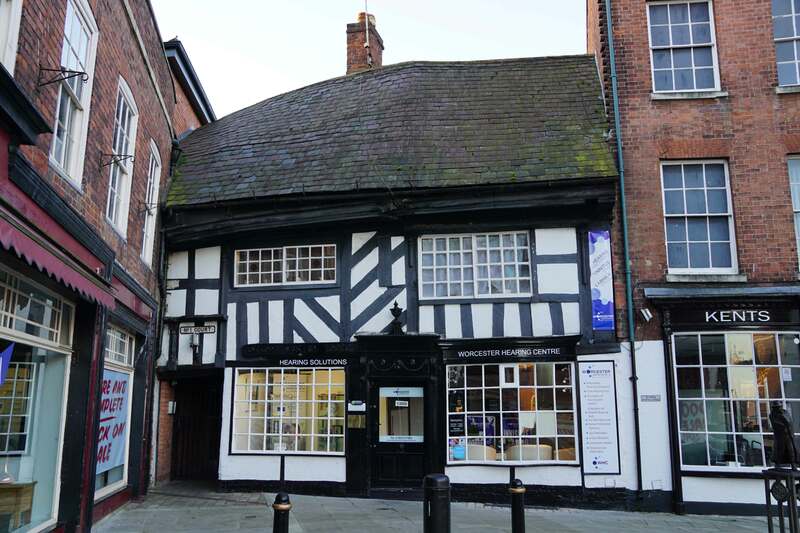 Just outside of Sidbury Gate was this building which served as the Royalist headquarters. Worcester Cathedral. The tower was used by Charles to view the battle and, after the Royalist defeat, the Cathedral was used to hold the captured prisoners. 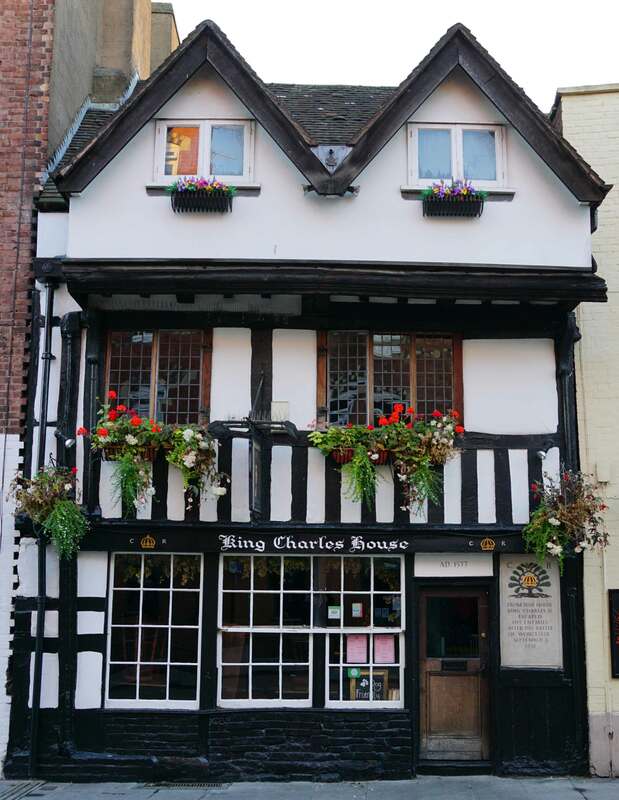 King Charles House. So called as Charles fled from here leaving the city by the adjacent St Martin's Gate, which by then was the only one of the city gates still in Royalist hands. The house was originally a large mansion that occupied the corner of New Street but parts have been demolished and it is now in two sections. Sidbury Gate. The gate is gone but its location was next to the Commandery (centre). Through here Charles led his assault on Red Hill in the latter stages of the battle. Viewing Platform. A viewing platform has been built overlooking the terrain to the south of the city. The chimney of the mill adjacent to Powick Bridge can be seen just to the left of the central electricity pylon. Worcester has ample city centre car parking with one option shown below . Powick Bridge and the Battlefield viewpoint both have parking available as does Powick Church.